This three-story brownstone condo in the well-sought-after area of Boston’s South End has a beautiful combination of contemporary and traditional restoration. What you see in our gallery is the before and after of this space. What you don’t see is the walls and floors that were torn out to start over. All new electrical, plumbing and sprinkler system is part of this restoration. From ceiling to floor, this kitchen has some creative design work. The arched high ceilings have recessed lighting combined with island lighting. The custom wood navy blue cabinets surround the custom gas range from France (La Chance ) is custom blue with brass. The size of the range requires a custom made-to-size commercial ventilation system, also in beautiful navy and brass. The island is white Calcutta marble, imported from Italy, draping across the top and flowing down to the floor completing this waterfall effect. This waterfall design has become a Boston trend. The hardwood floor is made of restoration lumber inlaid in the herringbone design. Renovating floors using restoration lumber is a design trend in Boston. One thing about brownstones they can be dark because they were built in an era when exterior or natural lighting was not something people strived to have in their homes. Today, more light is better, especially to eliminate the long winter blues endured by New Englanders. To bring the light into this kitchen, the architect designed this wall of glass on the outside wall. This 12 feet by 10 feet glass wall door system takes you to the balcony. Supporting this wall took steel columns and steel beams above and below. The kitchen opens into the dining room as you pass through an archway indicative of the brownstone era. The expansive dining room has millwork crown molding, milled woodwork on the walls down to the herringbone design wood floor carried in from the kitchen. We, the architect and the builder, saved the stone fireplace mantel adding the mirror and more milled work above the mantel to the ceiling. The spindled staircase adds elegance, opulence, space and architectural design to the room. The new wall of glass in the kitchen allows light into the dining room like never before. The living room light blue velvet furniture and light blue oriental rug are such a great contrast to the dark herringbone flooring and dark furniture against light grey walls. It’s a classic combination of contrasting colors and textures that makes the space inviting and calming. You just want to stay here for a while and take it all in. The dark staircase railings and steps against the white risers and white spindle rails draw your eye up the highly milled staircase. In the before and after pictures of this space, you can see today’s restoration is a compliment with the additional millwork duplicating the era of the time this charming brownstone was built. The addition of contemporary design with old world charm works well together. 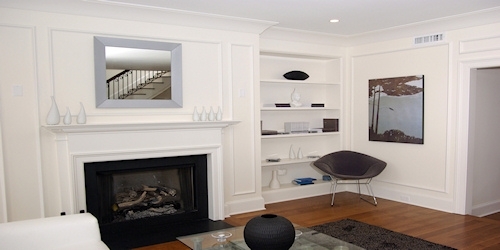 This living room has new custom detail cast-in-place plaster wall and ceiling molding. The master bath is complete with Boston renovation trending fixtures starting with the wall mounted toilet and vanity sink with radiant heat tile flooring. One never has to step onto a cold floor. The Carrera marble adorns the vanity countertop and shower walls. The rain shower head adds a sleek modern design. In case you were wondering, the wall mounted toilets can withstand up to 600 pounds. 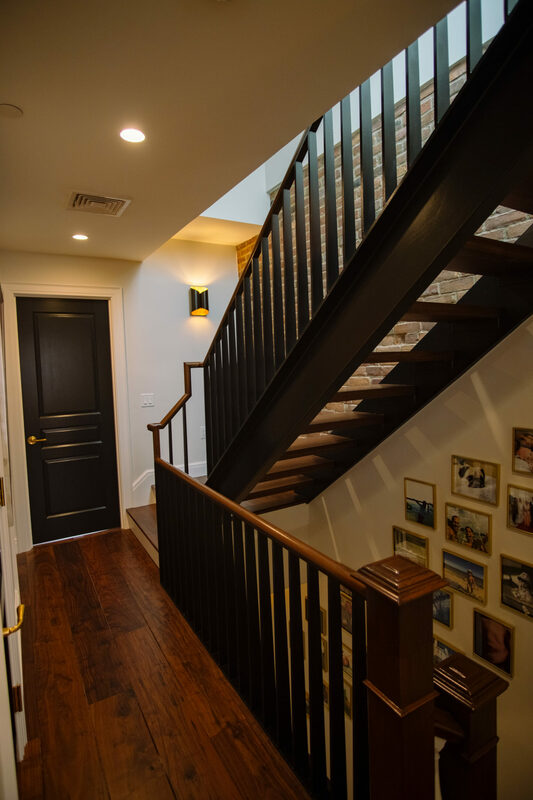 Guy and Connaughton did their magic making the living space to the open air and Boston skyline up to the roof deck with a new black steel staircase. The once steep staircase is now a gradual and winding staircase for easier access to the roof deck. This homeowner worked with the architect adding a gas fire pit, a kitchen area complete with sink and refrigerator, a commercial gas grill, railings, and lighting. And why not have a mini kitchen on the roof deck. Who wants to have to go below when refreshments run out? The refrigerator is installed under granite countertop to withstand the city elements and winters. Buying Brownstones and renovating to maintain their old world charm while adding 21st-century functionality. An art only for experienced architects and builders. Boston real estate continuously increases in value and demand. Naturally, you want to work with a contractor who will be an essential part of a cooperative team who will carry out your vision. It’s also critically important that your contractor gives you realistic feedback to ensure the project moves forward smoothly. Connaughton Construction understands your desire to have a home environment that not only meets your aesthetic requirements but will also be workable with for your day-to-day living patterns. Your home is your sanctuary. Ultimately, you want a space where the chaos of the world is left behind, and your soul is fed with calm and positive energy. 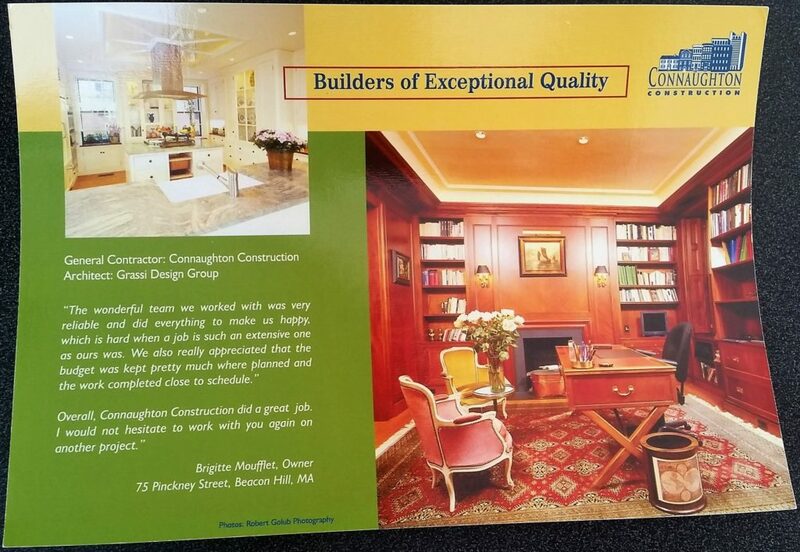 Contact Connaughton Construction, offering quality in distinctive craftsmanship, attention to detail and dedicated professional performance. 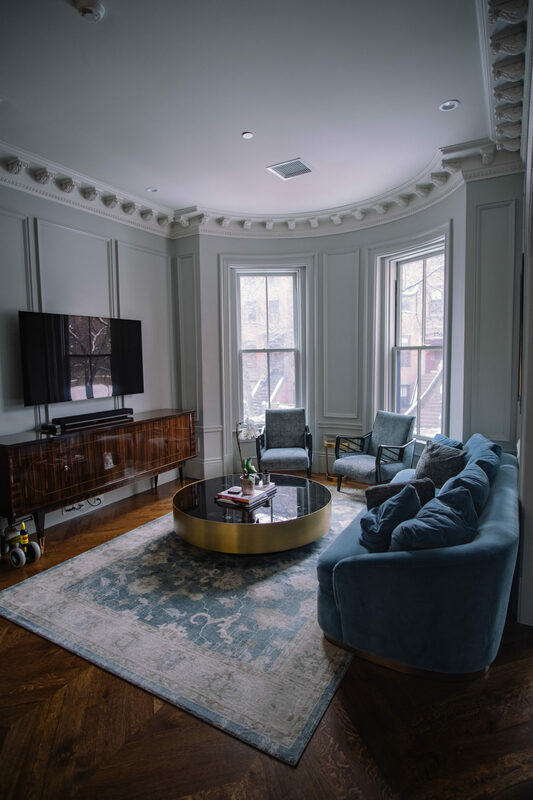 We are specialists in building new custom homes and renovating luxury homes – including historic Boston brownstones – for over 30 years. Hire the professionals who work as a team to make your dream home a reality. 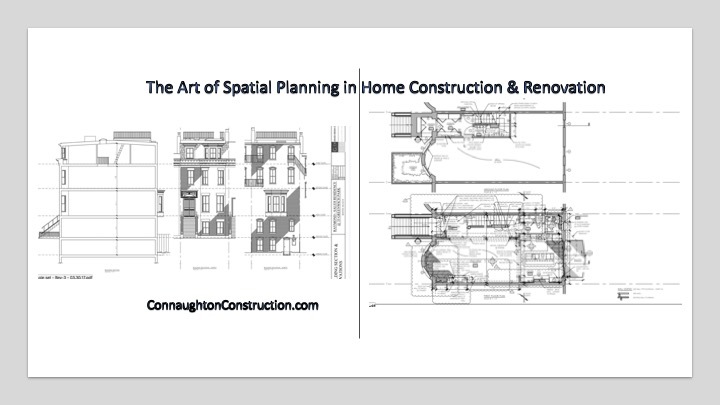 Request a FREE Consultation with Connaughton Construction and let the project begin. Design your story with Connaughton Construction. Leave your comments below. We love to hear some of the designs you see trending in Boston. Consider 3 ways to “save energy” when remodeling; Go Solar! Implement a high-efficiency Heating and Air Conditioning system. And insulate your home with icynene spray foam. We provide the main reasons these updates make sense for scheduling them into your remodeling project, down-to-the-stud renovations, or with new home construction. This post is for home buyers and current homeowners looking for energy saving ideas as you plan to renovate your home. Solar panels increase the value of your home. For high-efficiency solar panels, Connaughton Construction recommends either Sun power or the LG energy. The exact amount of any potential property value increase can depend upon your geographic location and the size of your installation. But according to a nationwide study by the US Department of Energy’s Lawrence Berkeley National Laboratory, resale values increase an average of $4 for each additional solar watt installed. A 5 KW system can increase the value of the home by $20,000. One of the biggest reasons to go solar is that you can eliminate or significantly reduce your electric bill. An average monthly electric bill of $200 becomes an annual $2,400 expense. … By installing a solar panel system, you also fix your electricity costs and make them more predictable. According to Direct Energy solar panels lower the cost of electricity bills ]. The use of solar energy reduces the carbon footprint. The power supplied by your system reduces the amount your home has to rely on conventional utilities, which burn polluting fossil fuels to generate electricity. Every kilowatt installed lowers your home’s carbon footprint by over 3,000 pounds annually. Polluting fossil fuels is electricity made with coal, natural gas, and oil. 4 main reasons why updating your HVAC during a home remodeling is a smart move. One of the most logical reasons to update your HVAC during a home renovation is simply because the work required. “Removing walls, drywall, and plaster is very common during renovations. So let’s say you complete a large home renovation. Then next year, you find out you need to replace your furnace. The drywall and plaster will have to be cut through again. This means more work, more repairs, more expense. Connaughton explains. “ Your HVAC needs change when your home changes” Connaughton explains. Typically, when a significant renovation is done and the windows & doors in your home are upgraded, your home will end up being better insulated. Typically, this results in your home having less demand for heating and cooling. This means it probably also needs a smaller furnace or air conditioner. “ When it comes to your HVAC, bigger is not better. A unit that is too large for your home will end up short cycling. Short cycling means it will blast on and off in a highly inefficient manner, thereby increasing your utility bill.” Connaughton explains. Having an inappropriately performing unit will also lead to an increase in wear and tear on the unit, quicker time to breakdown and temperature differences throughout the home. “During a renovation, drywall, plaster, and construction dust may find its way into your furnace or A/C unit. This could reduce efficiency and increase the chance of a future breakdown”, Connaughton explains. Since the HVAC tends to take a beating during a renovation, it makes sense to update it during a renovation project. “ Safety codes and standards are constantly being updated and new regulations pop up all the time” Connaughton explains. If you have an older furnace or A/C unit in your home, many components of that unit may no longer be to code or meet current safety standards. 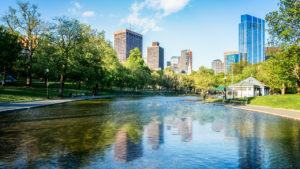 What are some of the high-end high-efficiency heating and air conditioning systems residents of Boston are implementing? Just like your furnace, replacing an older inefficient A/C can save you big time. Air–conditioning systems are measured by SEER (Seasonal Energy Efficiency Ratio.) High efficient systems will pay for themselves over the units lifetime, allowing you cool, dry, and most of all – affordable air. The most efficient system is a heat pump system with a high-efficiency gas or electric furnace. While a heat pump may seem to be an extra expense, in the long run, it is going to offer savings on your heating bill every month. Connaughton Construction recommends Mitsubishi as a high-efficiency electric heat and cooling pump. Lennox is our selection for high-efficiency gas heating and cooling. Icynene insulation spray foam insulation is popular and widely used insulation for residential and commercial buildings in the Boston area. It helps seal air gaps, keeping moisture out and preventing mold issues. Use icynene spray foam insulation in vented attics, unvented attics, external walls, crawl spaces, cathedral ceilings, and basements. Icynene spray foam insulation can adhere to most surfaces, including steel, wood, concrete, and masonry. 3 ways to Prepare for Northeast winters for Bostonians. Connaughton Construction has helped many homeowners size HVAC systems that are right for their homes as renovations may change the size of a system. If you are unsure, please have our experts analyze your system. You are in good hands with Connaughton Construction. We’ve worked with homeowners installing spray foam insulation and installation of solar panels. New HVAC system. New electrical wiring. New plumbing from brass to copper. New structural beams put in place to support the new open floor plan. In phase 1, the first, second and third floors were renovated down to the studs. On the first floor, the walls, ceiling, and flooring were ripped out. To achieve an overall open space the walls and ceiling were ripped out to make room for new plumbing and electrical. This also allowed Connaughton Construction to add a new wet bar and a new powder room. The wet bar is seen in the picture of what looks like a cabinet on the wall with the staircase behind it. The all-white wood cabinets are flush with the wall. An accent of white and gray marble on the wall under the cabinets adds subtle yet classic color and interest. The flooring was torn out to make room for new radiant floor heating throughout the first floor. It was then covered with a rich dark stain 3″ quartersawn white oak flooring. The addition was renovated into two-800 square foot offices. One for him. One for her. Here we added new floor-to-ceiling custom white wood windows, skylights, and built-in white wood cabinets with chrome accents. What was once a dark confined area is now a well lit, charming and well-organized area. 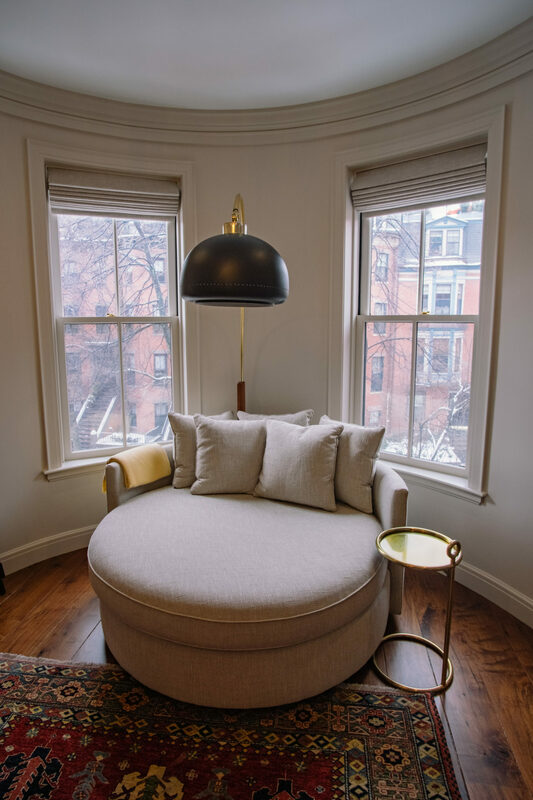 Three modern oval-shaped lighting fixtures brighten the space when natural lighting is not available. Customized millwork adorns the ceiling, walls, and flooring. The flooring is dark stained quartersawn white oak. A warm contrast to the white walls and a continuum of the neutral tones. Neutral tones create a timeless classic design. The kitchen has new beautiful built-in wood cabinets with flush appliances for continuous lines. Creating this elegant eating space we have new white and gray marble blanketing the “waterfall” island and sink, complimenting 2 flower-like glass chandeliers for the perfect accent and lighting with room for seating. The white and gray marble is carried over onto the countertop backsplash to add texture to the all-white walls and cabinets. The rich dark stain 3″ quartersawn white oak flooring is carried into the kitchen for a perfect room-to-room continuity. Still on the first floor where a new mudroom is added. No pictures of the mudroom. Sorry. Recessed lighting was added throughout all rooms. The second floor has three bedrooms all redone while keeping the large spaces intact. Bathrooms were gutted and full-size laundry with two washers and two dryers added. A master suite was added with walk-in closets and a master bath with a soaking tub and heated floors. The third floor had a series of small rooms that we opened up for 2 good size bedrooms and 2 separate baths. In phase 2 the renovations include the basement, the garage, and the exterior. No images available. The basement renovations include 800 square feet complete with plushly carpeted family room with large screen tv for their home movie theatre room. The garage renovations to accommodate 3 cars. The exterior renovations include a beautiful new slate roof and new wood shutters. Just what we love for that New England curb appeal. Landscaping was modified in the second phase as well. While Connaughton Construction does not provide landscaping services, we work closely with the landscaping architects to ensure the water lines and the proper electrical is in place to support the landscape design. Hard to find pictures of phase 2. The Challenge was ensuring the comfort of the owners and respect for their personal space as they lived in the residence as we renovated, both phases. Connaughton was also up for the challenge having to run new plumbing to the basement to upgrade to current code. Matching the old plumbing from brass to the new copper plumbing is challenging finding the copper that fits correctly. Typically, in order to qualify for the designation, a building must be at least 50 years old, must retain a high degree of integrity, and must have some level of historic significance. What’s the history of Newton? Well, you may or may not know the delicious Fig Newton snack was named after Newton. Nabisco, formerly known as the Kennedy Biscuit Company, named several of its products after towns in Massachusetts. Why is Suffolk Street considered a Historic district? The Old Chestnut Hill Historic District encompasses the historic residential heart of the Newton portion of Chestnut Hill, Massachusetts. Chestnut Hill was first listed on the National Register of Historic Places in 1986. Are there other renovation trends that you are seeing in Boston home design? Comment below. We’d love to hear what you’re seeing. If you are investing in property in Boston, there are a few facts you should know about how it works here. “We sell City property to developers who want to make the community better. ” according to the official City of Boston website, endorsed by Mayor Martin J Walsh. They sell a property through a competitive RFP process. The city looks for a price, proof of financing and experience with development. They choose Buyers who meet all the requirements. Who is buying in Boston these days? You may be surprised to see the amount of development going on in and around the City of Boston. Visit Boston’s website to see what is going on. When deciding which property to sell, they determine if the current real estate market supports the development. When they are ready to sell, the local residents are involved in determining how the property should be developed. They are involved in via public meetings and online platforms. The local community has a say if they want the property developed. Local residents help shape the requirements for the Requests for Proposals. Developers must present their ideas to the community for feedback. Are you an individual looking to buy land to build? The city sells to small builders and developers. Some of the best towns in MA are Cambridge, Brookline, Newton, Lexington, Boston, Belmont, and Winchester. Ranking of best suburbs of Boston Area based on a dozen areas; public schools, crime, real estate, family, nightlife, diversity, for starters. Cambridge is famous because of the many famous thinkers that have studied at the University. Members of Cambridge University have been awarded 88 Nobel Prizes. With a population of just over 100,000, it has many old, beautiful buildings. Brookline you will find Coolidge Corner bustling with people. There are plenty of top-notch eateries in Washington Square. The Coolidge Corner Theater is the top-rated Trip Advisor thing to do in Brookline. Where do you find out about properties coming up for sale? A property has to qualify for development before putting it on the market. How does it qualify? The property has to be developable. Some areas, like underwater parcels or floodplains, can’t be developed, therefore are not sold. And they won’t sell property that is meant for public open spaces such as urban wilds. The Department of Neighborhood Development (DND:FAQ) is included in deciding what a parcel is used for. They consult with the community, elected officials, and neighborhood organizations to obtain feedback regarding appropriate uses for a site. DND also considers this feedback in the context of characteristics of the site such as any known environmental or regulatory conditions, to ultimately decide on an appropriate use for the real property. Connaughton Construction has over 30 experience building new properties in empty lots in Boston. “We know how to form the right team, deal with the red tape, asbestos, change in occupancy, and shoring up the structure.”, says John. Hire the professionals that can make your dream home come true without the nightmare. If you prefer to talk to someone on the phone, please call John with Connaughton Construction at 781-899-1438 x 14 or Ellen at x13. You will be glad you did. Consider the art of spatial planning in home construction and renovation can make all the difference in your space? 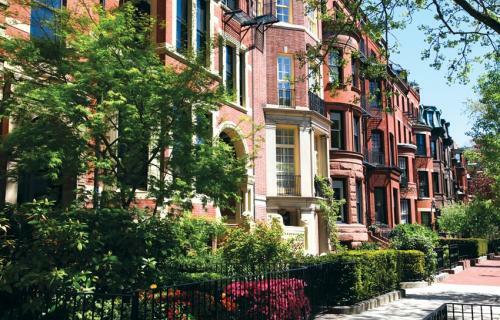 Are you someone who had a true love for the classic charm and architecture of Boston Brownstones – and always imagined living in one? No matter if you desire a newly constructed custom home or you’re ready to move full swing ahead with a home renovation, spatial planning is essential to consider. Spatial Planning Allows for Easier Living with New Construction or Renovations From floor plan creation to deciding on suitable art for the walls, spatial planning includes elements of design. It is a crossover of engineering and art, as it incorporates aspects of both architecture and interior design. Ultimately, it is organizing the use of space available within your home to be most effective for your lifestyle and activities. At the same time, considerations are made for appropriate levels of lighting, sightlines, and overall flow. Along with these key points, the homeowner’s personal style and vision cannot be overlooked. Whether creating a new space or modifying an existing space to better suit your needs, spatial planning optimizes the use of square footage with adjustment of the layout (sometimes moving walls), fixtures, colors, and furniture placement. It takes into account usability, proportion, and scale. Placement of furniture, options for storage, wall space, and both natural and artificial light sources are considered elements of spatial planning within a living space. The core objective is to enable people to move easily into rooms and spaces so that carrying on a daily routine is frustration-free. Many people desire a more simplified lifestyle. When it comes to day-to-day existence in a smaller area, maximizing the usability of available space certainly makes for the easier living. Spatial planning analyzes how living areas can be best utilized to create a home environment that improves the quality of life for occupants. Great spatial planning and design also deliver the perception of living in a space that is larger than its actual square footage. Consider too, the right color palette can sometimes lend to the illusion of openness when actual space isn’t an option. Surprisingly, spatial planning doesn’t only involve interior spaces. Outside views and access to outdoor spaces all must come together. You may want to incorporate more light into certain rooms based on activities happening there. Whether it’s taking advantage of natural light streaming in through floor to ceiling windows or coming up with customized lighting solutions, spatial planning, and design incorporate solutions that enable the space to best work for you – and be aesthetically pleasing as well. When creating lighting solutions, how far apart should we position recessed lighting fixtures? 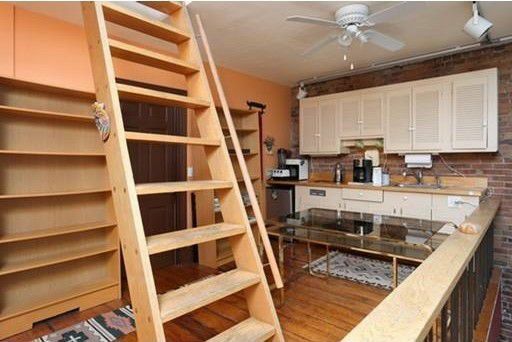 Start by dividing the height of the ceiling by two. If a room has an 8-foot ceiling height, you should space recessed lights approximately 4 feet apart. If the ceiling is 10 feet high, you’ll aim for each fixture to be placed approximately 5 feet apart. There may be architectural features that serve as focal points in a room, such as a hand-carved dinner table or a stone fireplace, or built-in cabinets. Or, there could be an objective to maintain a homeowner’s desire to balance the blend of traditional and modern. Spatial planning ensures that its such features carry visual impact, yet doesn’t interfere with the overall use of a room. One room that is central in every home is the kitchen. Kitchen design requires smart placement of work zones. Every kitchen must have a natural pathway between the sink, cooking area, and the refrigerator. Also, the width of a working area for a kitchen triangle space should be at least 42 inches for one cook and 48 inches for multiple people working in the kitchen. Everything you need should always be easily within reach, but you don’t want to be bumping into another person should you have a helper! When it comes to making a kitchen more usable, Spatial Planners think of integrating features into your cabinetry for storage and organization, keeping what you need right at your fingertips. Have your trash can hidden with a pull-out feature in your kitchen island. Storing spices inside your pantry door. These are solutions a spatial planner might suggest to improve the flow of activities involved in food preparation. As technology evolves, including a tablet mount below a cabinet to enable you to easily follow recipes found online or even providing a place to conveniently charge devices while working in the kitchen bring forth new considerations. Every home is unique. There are similarities in many projects but unexpected surprises often come up when renovating. There could be constraints in how spaces flow from one room to another, and sometimes there are budget constraints. Prioritizing desires and planning the placement of walls, features, and furniture so that everything works in sync, can be a challenge at times! In the end, you want a place to call home. Spaces that are welcoming, comfortable and fully functional. 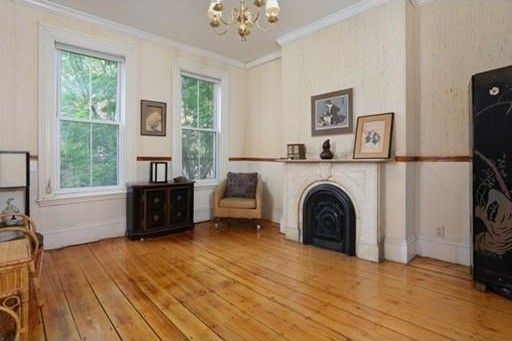 So you’ve purchased a Boston brownstone. 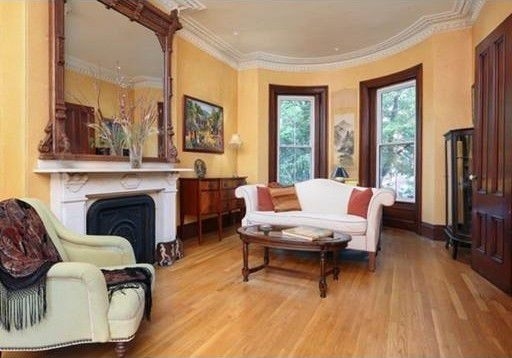 Brace yourself for 8 hidden costs of renovating a Boston brownstone. There may be some unexpected costs associated with owning this charming relic. These are old buildings and worth preserving their ancient charm. In most cases, you don’t have a choice. The local National Registry of Historic Places has a few requirements. But don’t worry. We’ll prepare you for what’s ahead. Connaughton Construction has been helping property owners for over 30 years get through the journey you are about to embark upon. 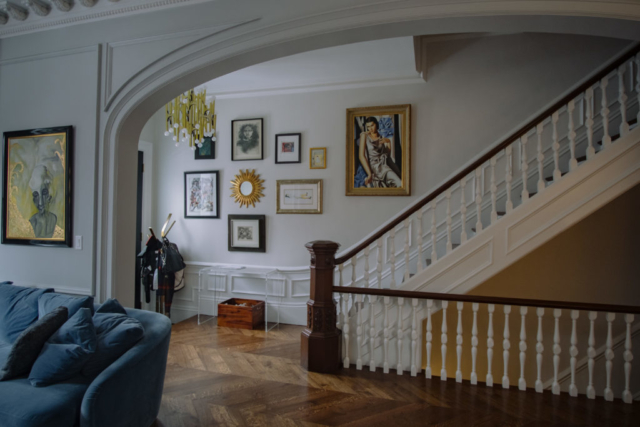 For historic homeowners who may have a vision of designing your dream brownstone, we’ll discuss a few hurdles to clear. But you’re an optimist. 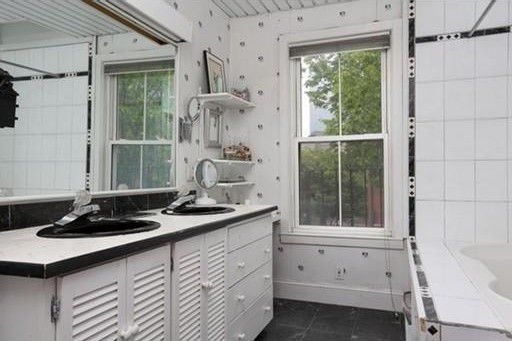 That’s why you’ve chosen a brownstone to renovate, right? As John Connaughton, the President of Waltham, MA a construction management company Connaughton Construction, puts it, while brownstone renovation can sound exciting and even fun at the outset, “the cost will be greater than you think, and the process will take longer than you think.” While this is true of most real estate restorations and facelifts, brownstones are special. Here are the unexpected costs to prepare for before you take on your own project, and a few tips to avoid headaches along the way. You want to open up the floorplan or replace the kitchen? Assemble the right team—everyone from the architect, contractor, to the structural engineer. When people get this part wrong, they spend the most money and time on their projects. 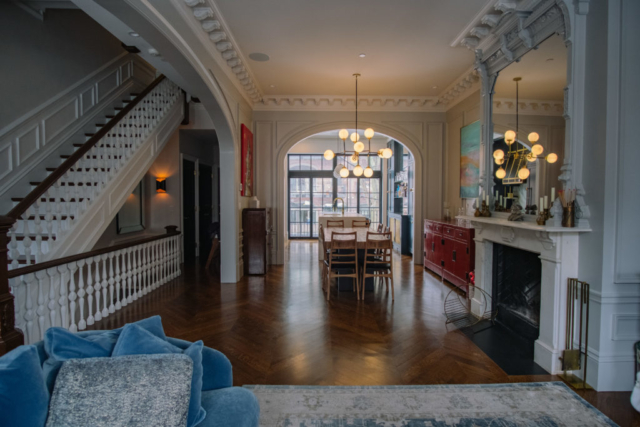 Brownstone owners on a budget often feel tempted to use companies that charge less because they have less experience renovating historic properties. But trying to save money the wrong way is the most costly mistake to make. Connaughton’s recommendation to homeowners is, “hire an architect who has experience with other brownstones or historic properties. These projects typically cost around $300 and $400 per square foot,” according to Connaughton. John warns that renovators should be wary of anyone offering a price below $300 per square foot—the experienced architect, who’ll likely charge the higher price, will guarantee to save you future mishaps, wasted money, and time. A qualified architect will also help you recruit the right team. You can check on each individual’s work and references to make sure their clients had a good experience. In the beginning, it’s all about the right professionals, the right process, and the right methodology. If this is your first time renovating in Boston, what surprises new brownstone owners the most is the number of approvals. This is where the architect and the construction manager are worth their weight. Having them in your corner can deflect a lot of the red tape. They know what and when to submit permits to the Inspectional Services. They’ve made the connections and built relationships with people in the NRHP, DOB, BLC and IS. The first step is finding out if your house is on the NRHP National Register of Historic Places. You’ll need permits from the Department of Buildings (DOB) for most interior and exterior work. The most challenging approvals are changes to the exterior; doors, windows, masonry, roofing, roof deck, and railings. 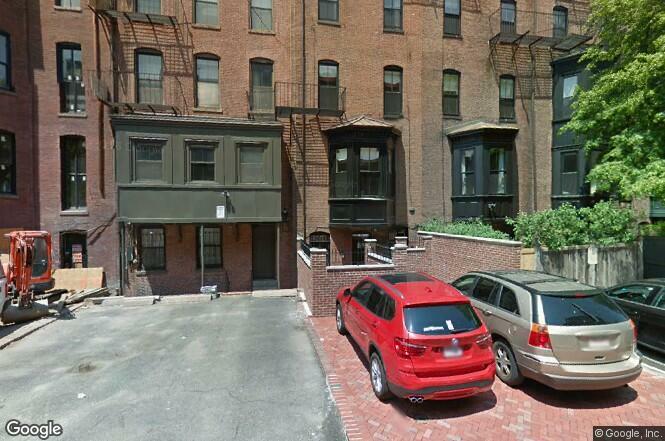 Brownstones in landmark historic districts need to go through the Boston’s Landmarks Commission. The sooner you reach out to them, the faster you receive approvals for your renovations. When acquiring a work permit, prepare for the DOB to charge you a nominal fee. A job priced between $100,001 and $150,000 will cost you $1,000 in permitting fees, according to the Landmarks Commission. 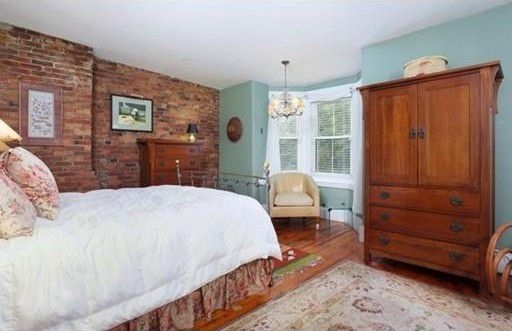 Boston calculates $10 for every $1000 in renovation costs, or 1% of the construction fees. 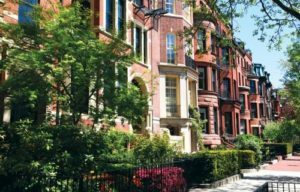 We’ve seen the previous renovation of Boston homes spend about $9,000 when changing a brownstone’s Occupancy Changing from a multifamily to a single family. Changing from a single family to 3-family is more involved because it involves zoning changes and goes through the Zoning Board of Appeals. Additional changes such as residential to commercial or vice versa go through the Certificate of Occupancy and zoning changes. You’ve likely hired an inspector to check out the facade and foundation walls before you purchased your brownstone. If the property has no recent renovations, it’s likely you’ll need to upgrade the structure for modern use. These are old buildings and major structural problems can occur from past changes. If your brownstone was a single-family, then broken up into multi-family units, the structural work often suffers. Consider the case of a Boston resident we spoke with. They’re in the midst of converting a four-family, five-story townhouse into a single-family. They need to replace the beams and the staircase in the process. It’s a high-end renovation. She and her husband are spending about $110,000 to replace the staircase through all five floors with expensive mahogany to match the original staircase built in the house. Add $100,000 for a mix of steel and wood structural beams. Replacing the stairs, a common project for homes that need structural upgrades can cost upwards of $12,000 for a pre-fab staircase or a metal staircase. The price goes upwards of $20,000 for a wooden staircase. Finding asbestos is a hot issue and is often associated with unexpected costs during the renovation. If you find asbestos during demolition, removal is required. It typically costs around $500. If your builder finds asbestos in one or two rooms, it won’t be a long project. It is likely you can continue to live in your home. For large-scale removal, it may take a week or longer and might require you to find new lodgings. Typical areas where it may show up include the basement, pipe insulation, and floor tiles. There’s a huge appeal to buy a brownstone in a historic district knowing that the quaint old townhouse next door can’t be demolished and replaced with a sky-high modern condo building. But it’ll also add extra costs, and time if you’re planning exterior renovations. Boston’s Landmarks Commission requires your architect to submit plans for approval before any exterior changes can be made. For minor work, like brownstone repair or window replacement, the BLC will not charge a permit fee. These permits are approved by the commission’s staff and your architect. 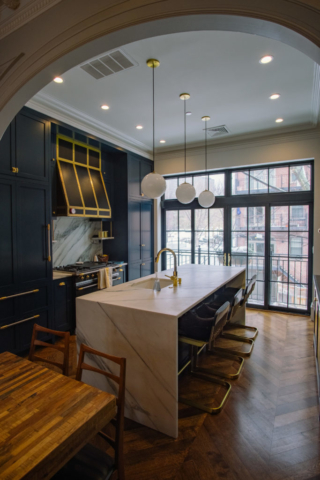 This is another reason you’ll want to invest in an architect familiar with brownstones. Facade alterations, however, cost a flat fee of $95 for the first $25,000 of work and $5 for each $1,000 worth of work above that, according to the BLC. Significant alterations, like adding an extra floor, will require that your architect makes a presentation to the BLC’s board. Restoring a brownstone facade to BLC standards requires specialists and can cost anywhere between $20,000 up to six figures depending on the amount of detail and scaffolding required to do the work, according to Connaughton. “It’s time-consuming and labor-intensive work,” he explains, noting that facade carvings will need to be restored by hand. Switching windows to landmarks specification will require new windows to meet the same glass size and details as the ones you are replacing. Connaughton also notes that renovators should be prepared to get creative with historically sensitive renovations, rather than expect to preserve every feature. “Replication versus preservation can be the difference of tens of thousands of dollars,” he says. Take, for example, a fireplace mantle that’s missing some of its corbels or moldings. To restore the fireplace and get new custom-made pieces can be expensive. Owners may instead opt for replacing the fireplace mantel. Talk to anybody who’s survived a historic renovation and they’ll tell you to prepare for a few curve balls. Demolition will reveal everything from structural problems to old piping to fire damage that’s been covered up. With the likelihood of surprise, most professionals recommend between a 10 and 15 percent of your renovation budget. After renovation starts, we may realize we need to replace the water main, a $10,000 – $15,000 cost. When renovating down to the studs, Boston Fire and the Inspectional Services Department require the installation of sprinkler systems, fire alarms, smoke detectors and carbon monoxide detectors. This can cost up to $60,000, depending on the size of the building. In a very old house, you don’t know what you’ll find. Look at the process as a leap of faith. I’ll be worth it. The payback is great. 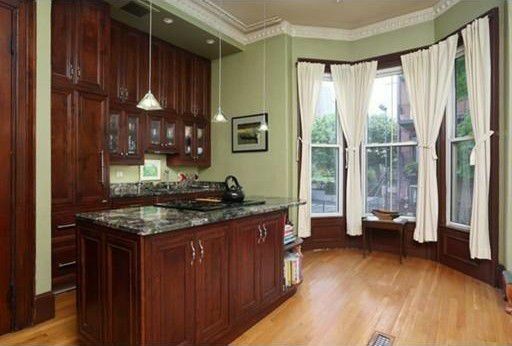 Connaughton Construction has over 30 experience renovating historic Boston brownstones. We know how to form the right team, deal with the red tape, asbestos, change in occupancy, and shoring up the structure. Hire the professionals that can make your dream home come true without the nightmare. A place in time where classic architecture meets contemporary design. The trends in style seem to be to go natural with a continuity in textures. Trends give us new ways of seeing and thinking. They sometimes reflect larger shifts in our society’s mode of living. As with most other aspects of existence, they don’t last forever. With that, we’ve polled the mind of one our region’s top building professionals to give us an overview of what they see coming, staying, and going—in New England style. One thing remains status quo – Our clients want the best materials and the best craftsmanship. One of the best ways to ensure you’re creating a kitchen with design staying power is to pay attention to the current direction of kitchen trends. For starters, the popular colors in kitchens this year are light shades of white and gray. Gray is such a classic color. It serves as the perfect background color for any room and lets us add other elements and layers to the aesthetic. Kitchens are no longer just viewed as functional spaces. Homeowners want to infuse their personalities into every space in their homes, and one of the best ways to add a sense of personal style to the kitchen is with lighting. More people are choosing large pendants or statement lighting for above their islands or centered in the space. Pendant lighting over islands. LED lighting both recessed and under counters. 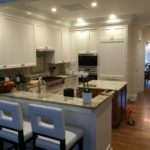 Custom kitchen cabinets also sport light colors and often times darker color island cabinets for a dash of color, a contrast, to add interest to the room. We have been seeing tile backsplash in glass, stone or ceramic are popular. This is where the continuity in color is continued, using glass, stone or ceramic for texture. Glass adds to high gloss we see in painted cabinets and painted millwork. People are spending a lot of time in the kitchen, chefing it up, entertaining, and family gatherings always go well with good food. Stainless steel appliances are still popular. High-end gas ranges, such as Viking and Thermidor with double wall ovens and separate gas cooktops. Custom stainless steel, brass or built-in vent hoods are popular. 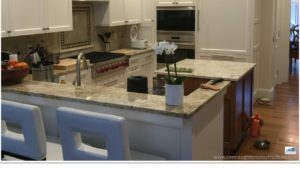 Stone countertops remain popular; granite, quartz and caesarstone. Granite was once the gold-standard in kitchen countertops, but it’s being phased out in most kitchens thanks to new, more durable options. Surfaces like engineered stone and soapstone offer a similar look to granite but require less maintenance. Goose and round neck faucets are very popular in the kitchen. They can be pulled out and used as a spray faucet for larger stainless steel or porcelain sinks. Luxury baths include both the large walk-in showers to the freestanding soaking tubs. Large tile or stone slab showers with body sprays and rain shower heads are popular. Doors to the showers are frameless. In New England, bathrooms are largely heated tile floors and heated towel bars. Countertops to double sinks are marble or quartz stone. Vanities are custom natural wood or painted for a splash of color. White isn’t just for the kitchen. It pours into the bathroom as well. 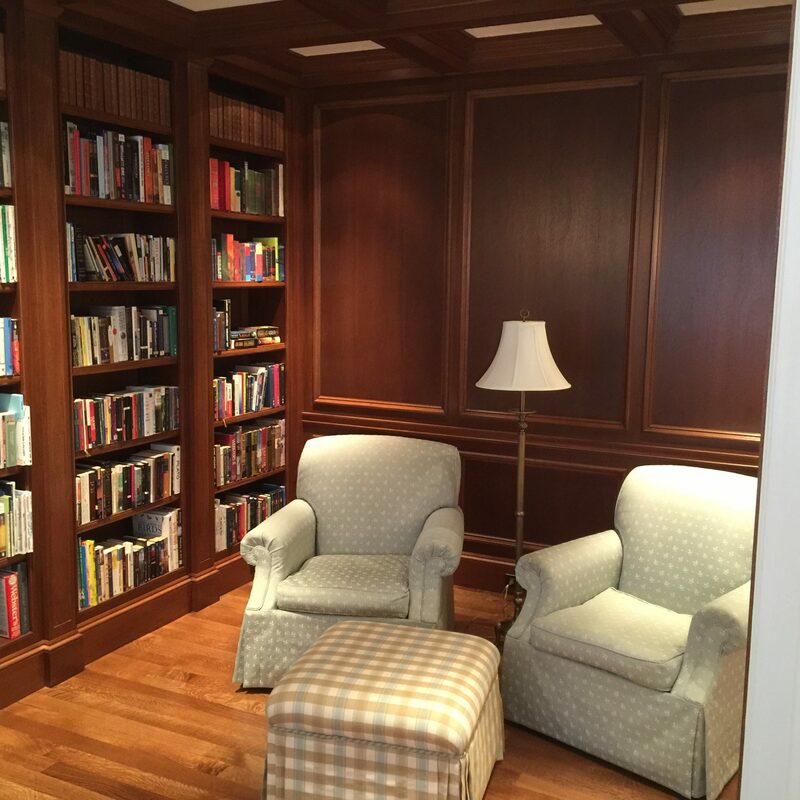 Connaughton Construction has renovated several homes with classic mahogany walls and African Mahogany wall paneling shown in this luxury library. 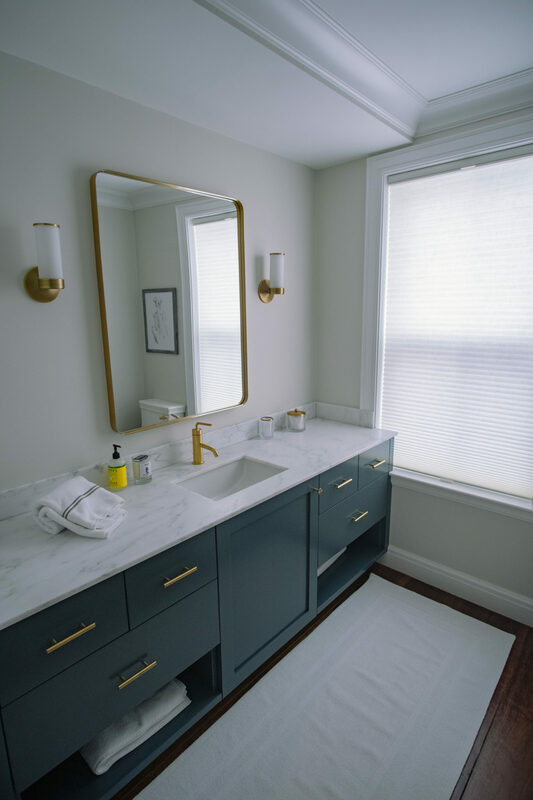 Connaughton Construction, has over 30 experience implementing many sustainable constructions, energy efficiency, smart technology, updated kitchens and baths, open floor plans and home offices. Gas fireplaces vented or ventless are an ideal choice for anyone who wants to enjoy the warmth of a fire without the chores of hauling wood and cleaning ashes. Because gas fireplace options are growing in popularity every year, manufacturers have geared-up to offer us a wide selection of appliances. You’ll find gas logs, freestanding gas fireplaces, and contained fireplace units that are mounted on a wall. Some gas log fixtures are vented so that gases produced during the burn travel outside, just as they move up and out of a chimney in a traditional wood burning fireplace. There’s more than one way to vent an appliance, so you may be able to install vented gas logs in your home even if you do not have a usable chimney. Gas Fireplaces. Are They Safe? Have your chimney cleaned by a professional chimney sweep before you fire up your gas logs for the first time. Although tests show that gas fireplaces do not increase carbon monoxide levels in your home, it’s safe to have the detectors if you use any gas appliances at home; including a furnace, a stove or a fireplace. Many gas fireplaces have safe technology. Can I convert a wood burning fireplace to gas? Yes, you can purchase gas log inserts. However, you will have to have gas available at your location or have lines installed. Vented gas logs can take the place of wood in a traditional hearth and chimney. You can choose a unit that burns either natural or propane gas. Be safe and always burn with the damper in a fixed open position. Gas fireplaces are not a solution for a problem chimney. If the chimney has cracks, dirty, or doesn’t draw air well enough to burn wood, it is not suitable for gas logs. Chimneys that are previously burning wood often times have a build up of creosote. Having a professional clean your fireplace chimney before installing and using gas logs will be safer. Stainless steel liners in older chimneys is a good solution for those not having clay linings or those flue liners that are in bad condition. Are All Gas Fireplaces vented? There are vented and ventless gas fireplaces. Vented or ventless refers to the gas logs. Vented gas logs require a fully functional wood burning fireplace. Ventless gas logs can be installed in either a wood burning fireplace or a ventless fireplace that is rated for aftermarket ventless logs. Ventless gas logs will produce more heat, while vented gas logs will look much more realistic. Gas Fireplaces Vented. Are they Efficient? Vented gas fireplaces have an extremely realistic flame pattern that looks like a wood fire. The flame dances and wraps around logs like real wood. Vented gas fireplaces may require a CO2 detector – depending on local fire department requirements. Gas Fireplaces Ventless. Are they Safe? The positive features of Ventless Gas Logs, they provide much better heat output than vented gas logs. They create less pollution. They use slightly less gas. The main byproducts of burning gas cleanly are Carbon Dioxide and Water Vapor. Because of this, ventless gas logs will introduce excess moisture into your home which could result in mold or mildew. You must be careful not to burn your ventless logs for extended periods of time with windows closed as they can deplete the oxygen in your home. If you burn your ventless logs for more than an hour, you must crack open a window to allow air into your home to replace the oxygen burned by the ventless logs. This will introduce cold air into the room and offset some of the heating benefits that ventless logs claim to have. Ventless logs produce an odor that smells like kerosene, can cause eye irritation and coughing spells to those who are sensitive. They are legal in Massachusetts. Law requires Ventless logs to have an ODS (oxygen depletion system) as well as a CO2 detector. The flame pattern with ventless logs is not nearly as realistic in comparison to vented logs. Because the gas must burn cleanly, the flame height is very low, it is more blue than yellow and appears to be less lofty. Also, you will find that the flame does not dance around like a real wood fire and very little of the flame actually touches the logs. If there is a mantel above the fireplace, you may need to install a hood to divert heat away from it. There are also BTU limitations based on the cubic feet of air available to your room. Measure the maximum BTUs allowed using this formula: Room Width x Room Length x Ceiling Height x 20. Ventless gas logs are not legal in a bedroom or confined space. Only vented units are allowed in bedrooms. Building codes and local fire departments require the damper in your chimney to be permanently fixed open if you install gas logs. You can reduce drafts and heat loss by installing glass doors in front of the gas fireplace. But the doors must remain open while the fire is burning. Connaughton Construction knows the Boston codes for CHIMNEYS, FIREPLACES AND SOLID FUEL-BURNING APPLIANCES. We recommend that you purchase a vented log gas fireplace, where possible. You will be happier with the flame that they produce and less likely to experience discomfort from odors or irritation. We recommend ventless logs when maximizing the heat output outweighs all of the other negative aspects. Connaughton Construction, a construction management company, has over 30 experience implementing sustainable construction, energy efficiency, and smart technology. Gas fireplaces have become popular for every room. Installing vent-free gas logs is not a DIY job. Having a professional install. He/she can do the proper tests on the gas pressure, make sure the installation meets building codes and follows the specifications. Request a Consultation with Connaughton Construction and let the new custom home project begin. Design your story with Connaughton Construction. What exactly does a Construction Manager do? you ask. A Construction Manager often called general contractors, will coordinate and supervise a wide variety of projects, including the building of all types of public, residential, commercial, and industrial structures, as well as roads, memorials, and bridges. John Connaughton, the owner of Connaughton Construction, is a Construction Manager who has worked with many homeowners, architects, and developers. “We have been custom building and renovating large residential projects into grand living spaces for over 30 years.”, says John. “As a Construction manager, we are responsible for setting and keeping schedules, monitoring finances, and making certain the team is accomplishing what they should every day. We help ensure that the workplace is free of safety hazards and deal with the various working relationships that exist on a job site.”, says Connaughton. Construction projects quite often involve a number of contractors and subcontractors. One of our most important jobs is making certain everyone is doing quality work and not cutting any corners along the way. We are constantly on top of costs. We make the necessary adjustments when unexpected complications arise. As Construction manager, we are able to identify and eliminate possible safety hazards for the good of everyone on the job site. It is our job to ensure that every provision of the contract is being met and that all parties involved are happy. Construction managers need to keep all parties well informed throughout the whole project. This includes the client, the architect, and any subcontractor and supplier involved. If issues arise, we deal with them immediately. This is where we must possess the communication skills necessary to lead a diverse team. The team includes all involved in the process from the site workers to the client to designers, architects, tradesmen and local building officials. Since most construction environments are fast-paced and are held to tight deadlines, the ability to effectively multitask is required to be a successful construction manager. Every city and state has certain rules to adhere to in order to complete the project properly. As a construction manager, we need to be well aware of the codes and comply with them. Most importantly we need to make sure that we are apprised of any and all changes to building codes. There is nothing more important than getting it done right the first time! A construction manager (particularly in Massachusetts) involves much more than just reading blueprints or spot-checking the quality of work being done. Qualified construction managers are knowledgeable about all standard building codes and understand the importance of green architecture. We use industry-specific software and have a good working knowledge of all aspects of each project. Connaughton Construction is knowledgeable in statistics, mathematics, architecture, and information technology. We specialize in planning, enforcement of building codes, scheduling, and cost estimation. Clients today want a qualified construction manager with real-world experience and overall knowledge of the principles of construction management for their projects. At Connaughton Construction, as the Construction Manager, we organize, plan, and manage the resources to make sure the labor, materials, and equipment necessary for the construction process run smoothly. Our best referrals are from real estate agents, architects, and previous clients. We’ve been building and reconstructing properties from the ground up for over 30 years. Our expertise is in the city of Boston where we know the building requirements and the departments of people who we need to involve in the approval process. We work closely with architects and property owners. With them, we have built our reputation as a top quality construction management of custom home building. 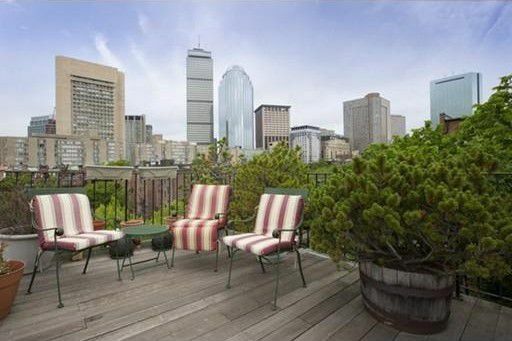 Many satisfied clients live in the City of Boston. We’re always ready for the next challenge. 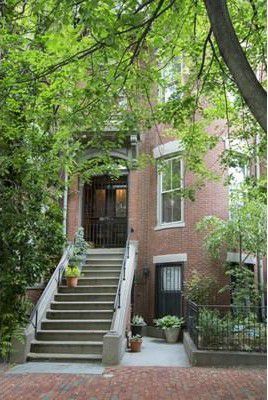 Outstanding extensive renovation of this 1899 residence located in the coveted and well sought after Back Bay of Boston. 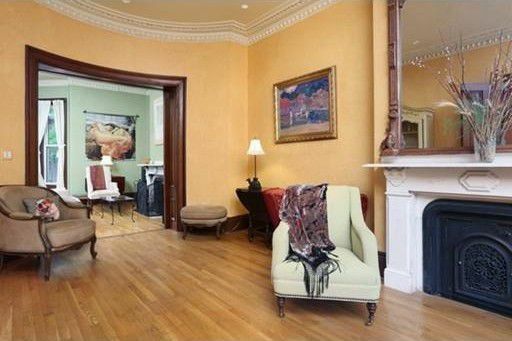 No detail was overlooked in this classic brownstone. See pictures during renovation. Design by noted architect Guy Grassi Grassi Design Group. Six floors of luxury and opulence from garden level to roof deck boasting over 11-foot ceilings. An elegant dining room with details of high ceilings, Italian marble mantel, classic wall molding, and oak floors. Beautiful decor adds to the ambiance with crystal chandeliers and rich tapestry complimenting windows and walls. This chef kitchen is prepared for the task of fine cooking and entertaining. Granite countertops with separate island, Wolf, SubZero, and Miele appliances and custom painted kitchen cabinets. The molding at the top of the kitchen cabinets is a popular design trend. It’s very elegant and adds interest to the kitchen. The library displays superior quality craftsmanship with mahogany built-in shelves, walls and coffered ceiling creating the warmth and luxury you’d expect in this side of Boston. 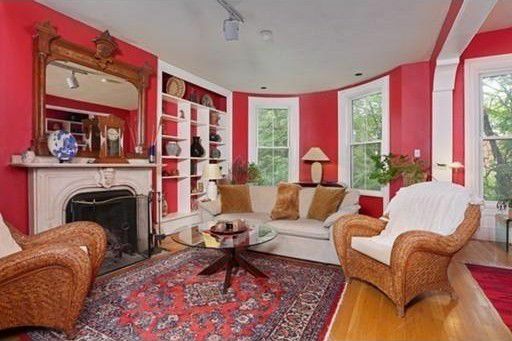 The sitting area that makes you want to curl up and read a book from the owner’s extensive selection. Accented with LED lighting. 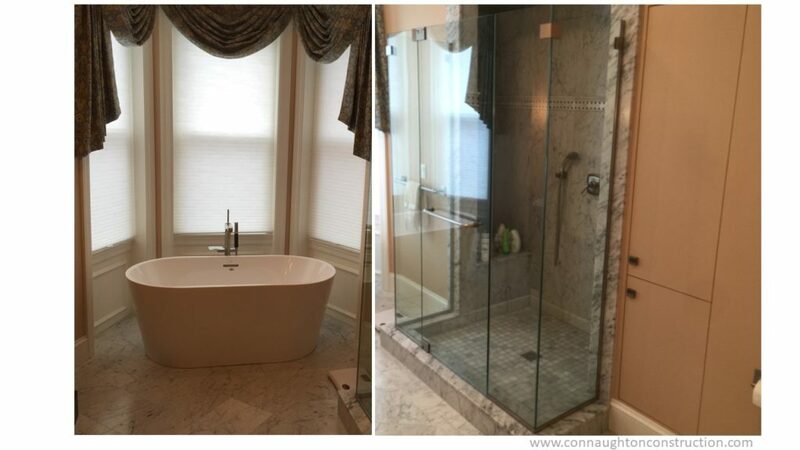 Connaughton Construction, creating luxury renovation and custom design and custom building in the Greater Boston area for over 30 years. We are a professional builder successfully combining our long-standing reputation for quality craftsmanship and construction service. We instill confidence in our customers through a proven organization, efficiency, and compliance with all building codes, specifications, and regulations. We know and comply with all permits and registrations that are required. If you have used our services, a referral is the greatest compliment you can give us. If you are looking for our services, we have plenty of reviews from delighted customers. Call us if you have any questions. We have solved many challenging problems that can appear in city living. You won’t be disappointed. Call us if you have any questions. We have solved many challenging problems that can appear in city living. You won’t be disappointed. Request a FREE Consultation with Connaughton Construction and let your new custom home project begin. Design your story with Connaughton Construction.